Saturday March 2, 9:00 a.m. – 2:30 p.m., Arlington will have a Bust Fest on Trap 4. This event is a lot of fun. It’s a great way to learn how to shoot trap or try out different shotguns. Bring a box of clays or $15 to cover the cost of a box of clays from the AGC. Ammo Requirements: Target loads with #7.5, #8 or #9 shot with a velocity of 1200 Feet Per Second (FPS) or less. 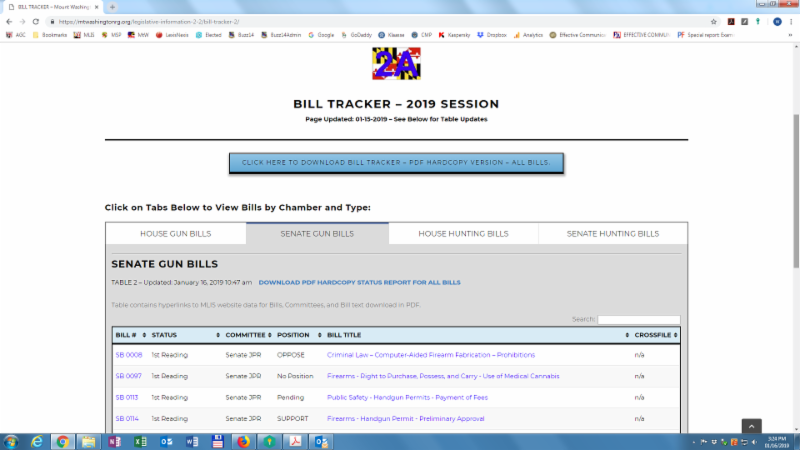 There are two antigun bills being heard in the Senate tomorrow. Try parking in the Gotts Garage behind the Senate Building. There is a cafeteria in the basement of the Senate Building. Try to get there no later than 10:00 a.m. to sign in if you wish to testify. The hearings start at noon. Please email the Senate Judiciary committee and ask for an unfavorable finding on these bills. SENATE GUN BILL DAY #2: Wednesday, February 27th at 12 Noon in the Senate Judicial Proceedings Committee (JPR). We need another strong turnout to counter the "Red T Shirt" anti-gun crowd. 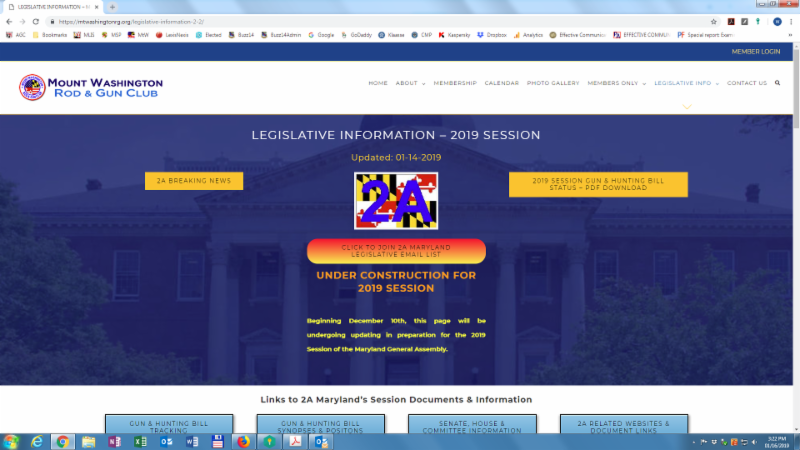 See links below, and on our Legislative webpages. A total of 19 gun bills were heard beginning at 10 AM on Monday morning, running non-stop all day, into the night, and not ending until approximately 4 AM. Thanks go out to all to all 1,200 plus gun owners who signed up to testify and especially to those who refused to be silenced by the long wait and stood their ground through the all day and most of the night hearing process. Special thanks to John Commerford, Deputy Managing Director, NRA/ILA for providing an impromptu pizza party for our side. We filled the hearing room and several overflow rooms as well; clearly outnumbering the "Red T Shirts", a local anti-gun organization, and out of state Everytown lobbyists. 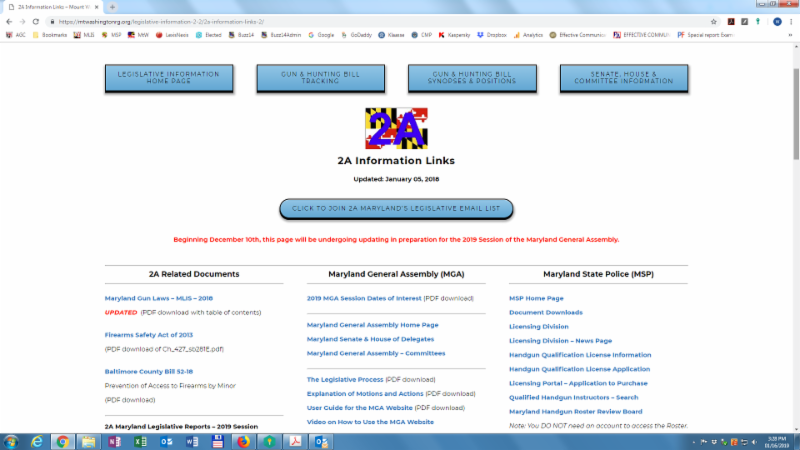 Please continue to encourage your friends and colleagues to join the 2A Maryland Legislative Emaillist. Accurate information in real time is critical to our effort to defeat those who would destroy our rights. Click here to send me your comments or suggestions. Hearing dates and agendas can, and sometimes do, change. Keep checking back for updates by Clicking here. Please call and email the members of the Senate Judicial Proceedings Committee. 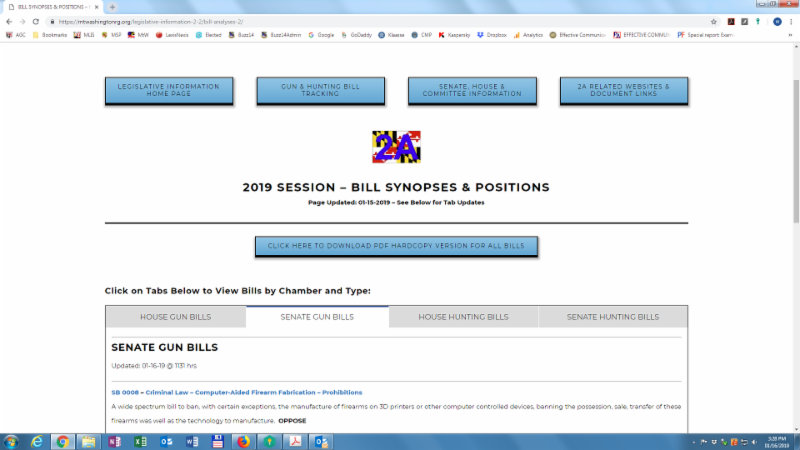 SB 0008 – This bill is being withdrawn by Senator Benson, who will lend her support to Senator Smith’s SB 882, a similar and equally offensive bill. 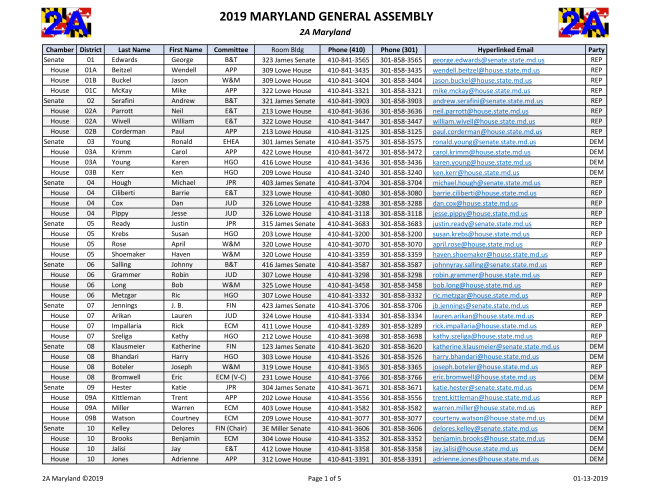 Scroll down for links to Committee and MGA contact information. 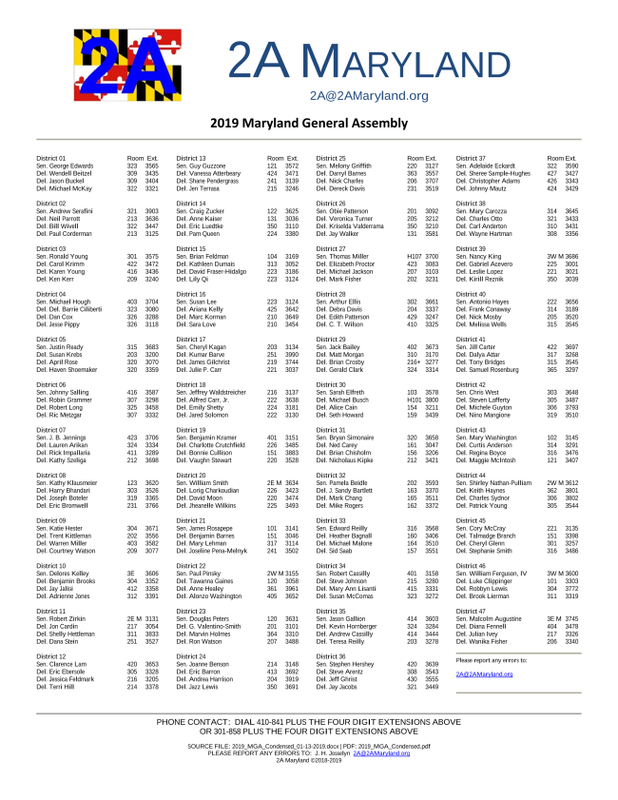 A listing by election district of all the members of the Maryland General Assembly. Including information on chamber, committee assignment, office address, phone numbers, hyperlinked emails addresses, and party affiliation. 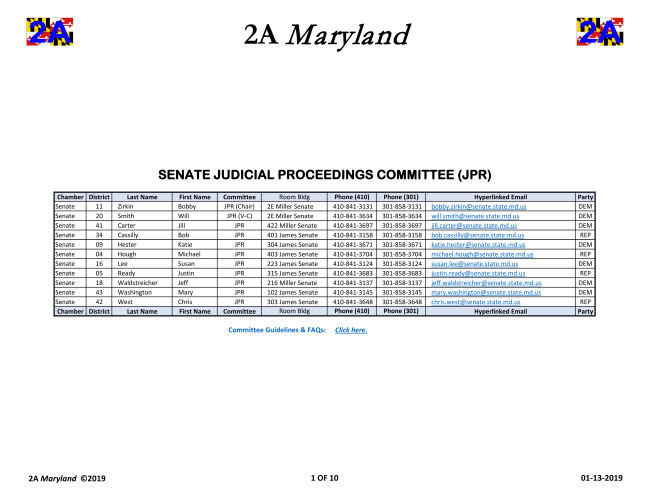 A listing of the primary Committees in order of interest to gun owners. 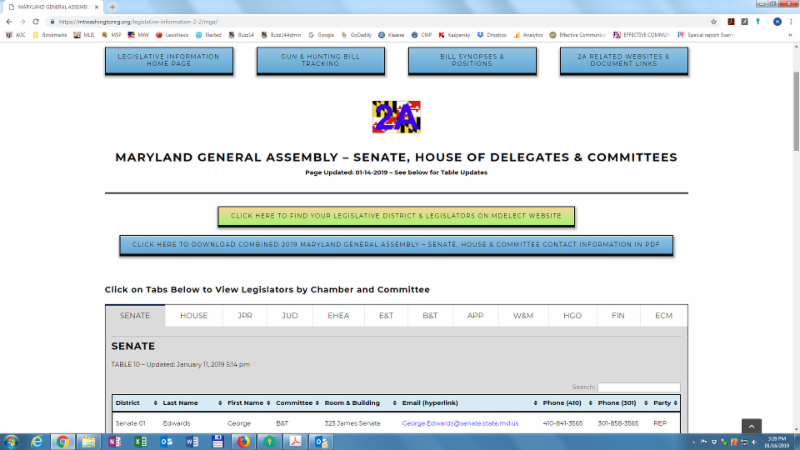 Including information on chamber, committee members’ names, office address, phone numbers, hyperlinked emails addresses and party affiliation. We just filled the Carbine clinic scheduled for 30 March with all 15 seats and I have one on the waitlist. All participants have been sent an email from me with the bulletin. If you did not get the email, you are not on the list. If you want to be on the waitlist, send me an email through the club executive officer email address on the website. We have had last minute cancellations in the past. I’ll be at the at the East Park and Ride at Broken Land Parkway near Rt 32 tomorrow morning. We should leave by 7:15 a.m. to give us time to take the shuttle from the Navy Marine Corps stadium. It costs $5 to park and $2 each way for the shuttle. You need exact change. We need to sign in for the hearings before 9:00 a.m. if you wish to speak. If you would rather submit written testimony you should have 30 copies. We need you to come out and show your support even if you are not able to testify. We had a big turn out 23 Feb at the action range. The weather was fair with impending rain coming at noon but folks still came out anyway. Good to see all the usual suspects and some new ones. The course was simple with no running but as we added stress from the timer and some bull horn careless whispering at the shooters, we soon found out how rusty everyone was. Nonetheless, everyone enjoyed the pleasant but loud social time on the range. Thanks to everyone for a safe and fun event. Keep an eye out for the start of Tuesday Night Steel starting in April and Carbine clinics this year. Our 30 March Beginner Carbine Clinic is just about full. If you are interested, you must be registered by sending an email through the executive officer club email address found on our website. There are no walk on participants. Arlington members, we will be hosting walk throughs for any interested members tomorrow at 10am. Please meet at the action shooting bays where we will be hosting a Action shooting 2 gun event. The walk through will take about an hour. 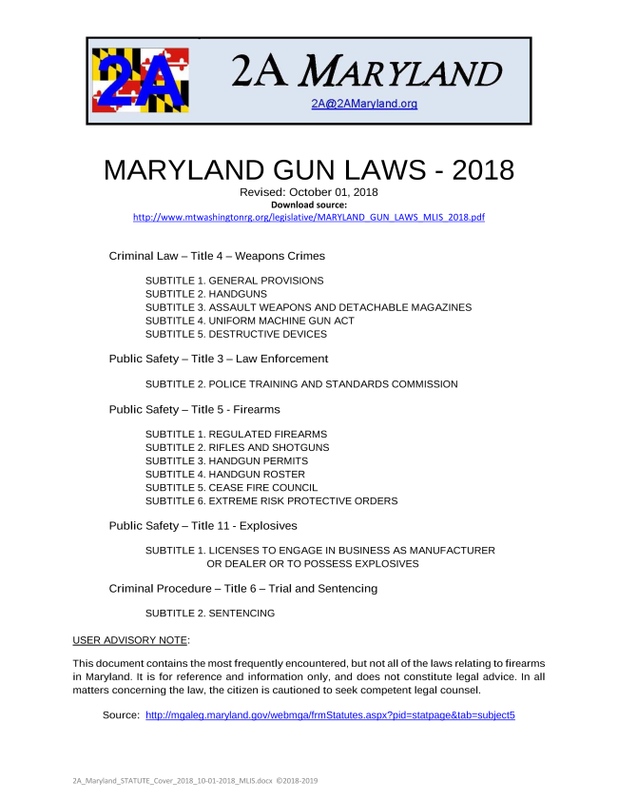 Every year, Anti-gun groups lobby the Maryland Legislators to get them to pass anti-gun bills that will severely restrict your rights. Please check the link below. We need you to call, email, meet with or better yet, come to Annapolis for the hearings. I was typing two emails today. One for the Carbine Clinic which is in March and one for this weekends action shoot. The action shoot email said March. The action event is actually February 23 this Saturday 0900-1430. Sorry for the confusion. We will be having an Action shooting event Saturday 23 March from 0900 to about 1430hrs on the action shooting range. This will be a two gun rifle and pistol only event. Safety brief will be at 0930. Nobody shoots without a safety brief. We will not stop the event to perform briefs for latecomers. Bring a holster rig with mag holders for rifle and pistol. Full coverage eye pro and ear pro are required. You will be utilizing your safeties on your firearms when you don’t have a sight picture. Round count will be low. About 10-12 rifle and 12 -15 pistol rounds per run. Bring your sling if you have one. If you need the practical test for Holster cert, do your test online and print your training sheet so I can sign it if you pass. The grounds will be mushy for sure after all the weather this week. We will keep the movement to a minimum to reduce slipping risk on the wet ground. Reminder: Steel Plate Pistol Shoot tomorrow! We have a steel plate pistol shoot tomorrow, Saturday, February 16, at the pistol range from 9:00 a.m. – 2:30 p.m. Standard Calibers from .22 LR to .45 are allowed. Magnums are not. Wrap around eye protection and ear protection is mandatory. We need help with setting up targets. Please meet at the club shed on the Barnes Range to load the steel at 8:15 a.m. This is a very popular event and is a lot of fun.